Skat has been supporting SDC in two of its thematic networks: the RésEau (in the framework of the Backstopping Mandate in Water and Sanitation) and the dlgn: the Decentralization, Democratization and Local Governance Network. Since 2010, Skat has been providing support to the SDC’s focal point for the Decentralisation, Democratization and Local Governance Network. From 2010 – 2011, Skat together with Ximpulse Consultants supported and advised the dlgn Focal Point on thematic issues, institutional learning, knowledge sharing, and networking. The assignment also included the revision of the Share Web, the moderation of e-discussions, and support in the planning of a F2F workshop in Sarajevo. From 2012 – 2014, Skat supported the Focal Point in the publication, editing and dissemination of the dlgnews. 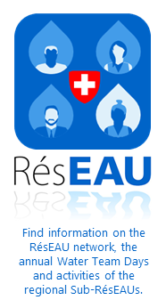 Networking and knowledge sharing, where the Water Team Days, the yearly Face-to-face event of the RésEAU is being organized and facilitated. This also included the support in the organization and facilitation of other learning and sharing events of the Sub-RésEAUs: Central Asia, Eastern Europe and West Balkans.